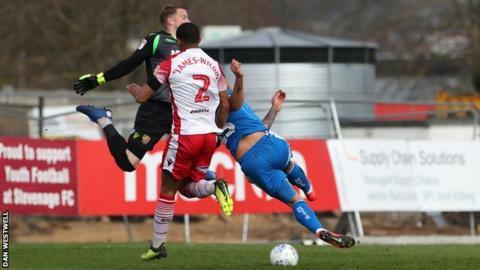 Jim O'Brien's second goal of the season helped breathe new life into Notts County's League Two survival hopes as they humbled Stevenage 3-0 to lift themselves off the bottom of the table.. The Magpies midfielder was on target inside 40 seconds, when he tried his luck from 25 yards and his effort deflected devilishly into the net. Then, midway through the first half, O'Brien's pass bewildered the Stevenage defence to set up Kane Hemmings, who composed himself before slotting home past Paul Farman. Home goalkeeper Farman had to be alert to keep out an effort from the evergreen Jon Stead but County had a third goal before the break. Stead was the architect, the striker teeing up Enzio Boldewijn to smash home on 45 minutes. Dino Maamria's Stevenage tried in vain to hit back in the second period, but the closest they came was when Alex Revell had a penalty shout waved away by referee Andy Haines. Match ends, Stevenage 0, Notts County 3. Second Half ends, Stevenage 0, Notts County 3. Attempt saved. Mitch Rose (Notts County) right footed shot from outside the box is saved in the bottom right corner. Corner, Notts County. Conceded by Ben Nugent. Substitution, Notts County. Lewis Alessandra replaces Kane Hemmings. Attempt missed. Emmanuel Sonupe (Stevenage) right footed shot from outside the box is close, but misses the top right corner. Corner, Stevenage. Conceded by Robert Milsom. Attempt missed. Michael Timlin (Stevenage) right footed shot from outside the box is high and wide to the right. Kane Hemmings (Notts County) wins a free kick on the right wing. Foul by Alex Revell (Stevenage). Substitution, Notts County. Craig Mackail-Smith replaces Enzio Boldewijn. Substitution, Notts County. Pierce Bird replaces Jon Stead. Michael Timlin (Stevenage) wins a free kick in the defensive half. Foul by Mitch Rose (Notts County). Foul by Sam Stubbs (Notts County). Substitution, Stevenage. Michael Timlin replaces Joel Byrom. Corner, Stevenage. Conceded by Ryan Schofield. Attempt saved. Ilias Chair (Stevenage) right footed shot from outside the box is saved in the top right corner. Attempt saved. Sam Stubbs (Notts County) header from the centre of the box is saved in the centre of the goal. Corner, Notts County. Conceded by Scott Cuthbert. Substitution, Stevenage. Kurtis Guthrie replaces Danny Newton. Joel Byrom (Stevenage) wins a free kick on the right wing. Arthur Iontton (Stevenage) wins a free kick in the attacking half. Attempt missed. Emmanuel Sonupe (Stevenage) right footed shot from outside the box is high and wide to the left following a set piece situation. Corner, Stevenage. Conceded by Matt Tootle. Attempt blocked. Ilias Chair (Stevenage) left footed shot from the left side of the box is blocked. Luther Wildin (Stevenage) wins a free kick in the attacking half. Foul by Kane Hemmings (Notts County).